Ecoregions denote areas of general similarity in ecosystems and in the type, quality, and quantity of environmental resources; they are designed to serve as a spatial framework for the research, assessment, management, and monitoring of ecosystems and ecosystem components. By recognizing the spatial differences in the capacities and potentials of ecosystems, ecoregions stratify the environment by its probable response to disturbance. These general purpose regions are critical for structuring and implementing ecosystem management strategies across federal agencies, state agencies, and nongovernment organizations that are responsible for different types of resources within the same geographical areas. 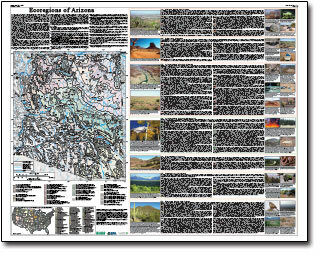 The Arizona ecoregion map was compiled at a scale of 1:250,000. It revises and subdivides an earlier national ecoregion map that was originally compiled at a smaller scale. The approach used to compile this map is based on the premise that ecological regions can be identified through the analysis of the spatial patterns and the composition of biotic and abiotic phenomena that affect or reflect differences in ecosystem quality and integrity. These phenomena include geology, physiography, vegetation, climate, soils, land use, wildlife, and hydrology. The relative importance of each characteristic varies from one ecological region to another regardless of the hierarchical level. A Roman numeral hierarchical scheme has been adopted for different levels of ecological regions. Level I is the coarsest level, dividing North America into 15 ecological regions. Level II divides the continent into 50 regions. At level III, the continental United States contains 105 ecoregions and the conterminous United States has 85 ecoregions. Level IV is a further subdivision of level III ecoregions. Arizona contains arid deserts and canyonlands, semiarid shrub- and grass-covered plains, woodland- and shrubland-covered hills, lava fields and volcanic plateaus, forested mountains, glaciated peaks, and river alluvial floodplains. Ecological diversity is remarkably high. There are 7 level III ecoregions and 52 level IV ecoregions in Arizona and many continue into ecologically similar parts of adjacent states. This poster is part of a collaborative project primarily between the U.S. Geological Survey (USGS), USEPA National Health and Environmental Effects Research Laboratory (Corvallis, Oregon), USEPA Region IX, U.S. Department of Agriculture (USDA)–Natural Resources Conservation Service (NRCS), The Nature Conservancy, and several Arizona state agencies. The project is associated with an interagency effort to develop a common national framework of ecological regions. Reaching that objective requires recognition of the differences in the conceptual approaches and mapping methodologies applied to develop the most common ecoregion-type frameworks, including those developed by the USDA–Forest Service, the USEPA, and the NRCS. As each of these frameworks is further refined, their differences are becoming less discernible. Collaborative ecoregion projects, such as this one in Arizona, are a step toward attaining consensus and consistency in ecoregion frameworks for the entire nation. Griffith, G.E., Omernik, J.M., Johnson, C.B., and Turner, D.S., 2014, Ecoregions of Arizona (poster): U.S. Geological Survey Open-File Report 2014-1141, with map, scale 1:1,325,000, https://dx.doi.org/10.3133/ofr20141141.